The attic and crawl space are the least visited place in our homes, but they hold numerous fond memories and precious belongings.The property’s all important insulation and ventilation system also has roots in this quiet area. 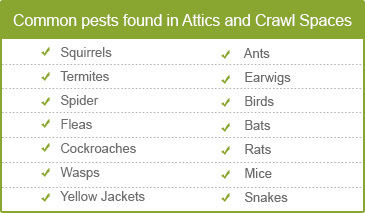 Leaving the attic crawl space unattended may turn them into breeding grounds for unwelcome visitors. Periodic assessment, monitoring and enhancement of the attic and crawl spaces ensure long term benefits for your home and office. Leaking ducts let way for harmful gases. Free and uninterrupted flow of these gases can have severe health implications. Excessive moisture seeps in through cracked ducts. Mold and mildew thrive in these conditions and spread around harmful diseases. Dripping ducts also impair the building’s insulation system which raises utility bills manifold. Termites and mites eat into the wood and building structure. Pests and insects like wasps, roaches and fleas are carriers of harmful microorganisms. They move about unobstructed and spread dangerous diseases. Animals like rats, bats and mice chew away wire cables, upholstery and furnishings. Their urine, feces and dead remains make the area smelly and unpleasant. Professional assessment of the attic and crawl spaces help unfold numerous issues that often go unnoticed by the naked human eye.Our preliminary inspection is free of charge and is carried out at the time most convenient to you. During the process our team will look into each nook and cranny of the area so that even the smallest issue get surfaced and resolved at the earliest. We understand the importance of your hard earned money. 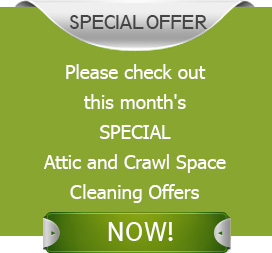 Our attic and crawl space service are thus priced at the most cost effective and affordable rates. We are mesmerized with the beauty of North Arlington!A small borough in Bergen County, New Jersey, North Arlington is home to nearly 15,000 people.Beautiful houses, well-structured offices, malls and markets, green outfields and parks, North Arlington has everything to boast about.Let us help you in maintaining the serenity of the place.Our specialized attic and crawl space services will help you keep your property in top notch condition. Give Quartz Solutions a ring 201-205-2042 to book your free inspection.